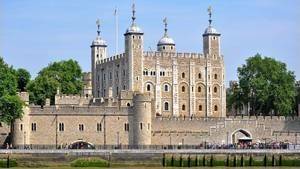 The Tower of London is the symbol of the power of the English monarchy, it was William the Conqueror who built it. Today it has a major function: to keep the jewels of the British crown. It is a role that it has since the thirteenth century, we were then under King Henry III. These exceptional jewels have been exhibited to the general public since 1669. Before entering the room of jewels, it is necessary to know that the photos are prohibited probably for reasons of security: the jewels have been the object of numerous attempts of robbery, and it is useless to simplify the work of thieves, although these days it is probably not a few pictures of the alarm systems that allow to enter the room. For centuries, the Tower of London served to shelter the most important elements for the king, for his everyday life: formal clothes, jewels, crowns, and all that could have value. The crowning ceremony of the monarch has existed for more than 1000 years but the crown itself is much more recent, it is a modern piece that is exposed like most other pieces. The jewels were kept in different places at the tower. throughout history. They were shown to the public for the first time in 1665. The Crown Jewel Room, which is seen today, dates from 1967, it is in the eastern part of the Waterloo barracks. Of course this area is terribly secure, it contains not only jewelry but also royal objects like serving dishes. The latter were exposed on the first floor. In the course of time, the number of visitors increased, and it was necessary to create larger rooms. The construction of this room dates from 1992 and was completed in 1994. It is 3 times larger than the previous one and can accommodate many more people at the same time. So there is less time waiting to admire the jewelry. And even if it has to be remade, we took the opportunity to improve the safety, for example presenting the main parts behind bulletproof windows ... 5cm thick! Each showcase is equipped with the best conservation systems. They have a ventilation which sends out filtered air as well as lights based on optical fibers. Tips : Do not forget to take a picture with the guard, at the entrance of the room of jewels, it will make you a great memory! Once inside the jewelry room the first area is called "Hall of Monarchs" ("Hall of Monarchs"). You will find the coat of arms of the British monarchs of William the Conqueror to Queen Elizabeth II as well as the main ornaments of medieval heaumes over time. It is always interesting to see the evolution of these decorations that identify the British forces vis-à-vis their enemies. The visitors continue their discoveries through the (optional) viewing of the 3 films (rather short). One of them shows the coronation ceremony of Queen Elizabeth II in 1953, it was the first time in history that this event was broadcast on television, we see the very young queen advancing, crowned on the head. This crown, you will see it a little farther. The next hall is a long hall, it is called the processional hall, it is the place where the masses are exposed. Originally the masses were medieval weapons of wood and metal, but in time they became symbols of the authority of the king or queen. The most worked masses are made of precious metals and encrusted with jewels which reflects the high rank of its owners. Then, the next room shows the famous crown of England. This is where the conveyor belts are located to avoid clogging in front of the windows. 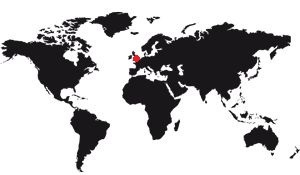 There are the principal crowns of the kings and queens of England. Do not worry if you have not had time to see them well, you can easily go back and resume the treadmill again. If there are people, just put yourself in line and iron as many times as you like. And then there's also a treadmill on the other side of course! It has a frustrating side because you can not stop long in front of a crown to admire all the jewels, but it has the advantage of allowing everyone to see them, and without busculade. You will see the Imperial State Crown worn by the Queen every year at the opening of the parliamentary session. It is the queen's main crown. There is also the "Queen Victoria Diamond Crown", the Queen Mother Crown which has the distinction of having the diamond known as Koh-i-Nor, a diamond of 105.6 carats. In the following room are displayed the royal insignia such as the dress worn by Queen Elizabeth II. After the execution of King Charles I in 1649, Oliver Cromwell ordered the jewelery to be melted or sold in order to make pieces, to enlarge the treasure. This period corresponds to a major event for the jewels of the crown which were lost. Charles II is sometimes called the king without crown, following the fact that it is the first to be crowned after the disappearance of the royal jewelry collection. However, new royal insignia were made in 1661. Most of the objects shown in the jewel room date from this period. There is a spoon of the coronation, it is the oldest piece since it survived the destruction of Cromwell of the seventeenth century. The scepter is also seen on the cross, it is known to have on its upper part the Cullinan I, a diamond of 530.2 carats, making it the largest diamond in the world. It was set in 1910. The figures are eloquent, and one understands why there is a craze for the jewels of the crown: they are above all 23 578 precious stones! 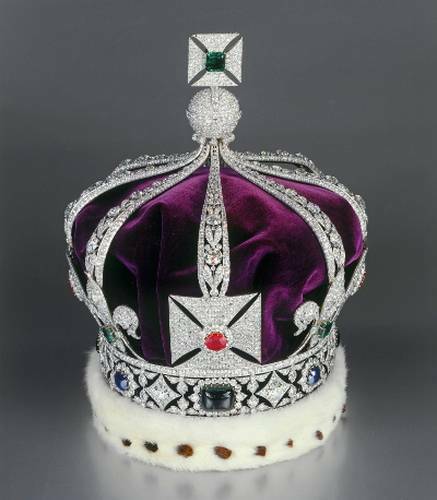 The Imperial State Crown contains 2868 diamonds, 273 pearls, 17 sapphires, 11 emeralds and 5 rubies. Note that one can also admire the largest cut diamond in the world, the "First Star of Africa", from Cullinan, the largest diamond ever discovered in the world. He ascended the Imperial scepter. These monarchical symbols are still used by English rulers during coronations. This crown is the most important and sacred of all the British crowns. It is only used at the time of the coronation proper. It was rebuilt in 1661, replacing the crown used during the medieval period which was melted during the civil war. 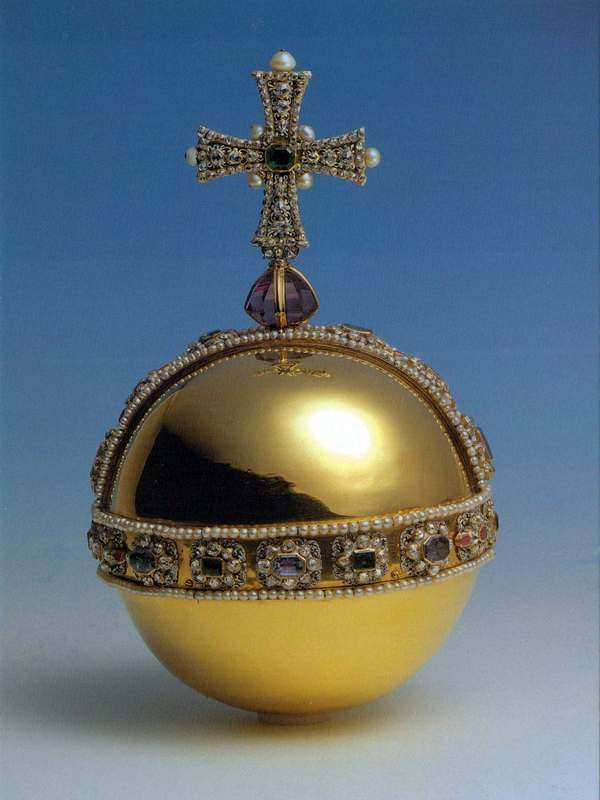 Learn more about: St Edward's Crown. This crown, which was made in all parts for the coronation of George VI, was carried by this new monarch when he left the Abbey of Westminster after the coronation ceremony. It is also worn by Her Majesty the Queen at each parliamentary session. Learn more about the Imperial State Crown. This hollow globe is made of gold, it is one of the British royal symbols. One finds orbs under many monarchies, such an object is the symbol of the Christian world. This was used at each coronation of Charles II. It contains valuable gems, including 365 pink diamonds. 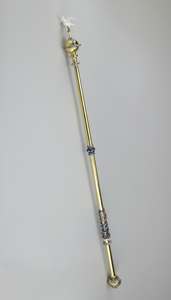 This scepter is one of the most prestigious in the world. The dove at the top symbolizes the Holy Spirit, which shows the spiritual side of British authority. It is made of gold inlaid with 285 gems. This royal scepter was used for, among others, Queen Victoria in 1838. Since it was young it had to be modified to reduce the size of the handle, too large at the time. The enormous diamond named Cullinan I, the largest cut diamond in the world, was set at its top in 1911. 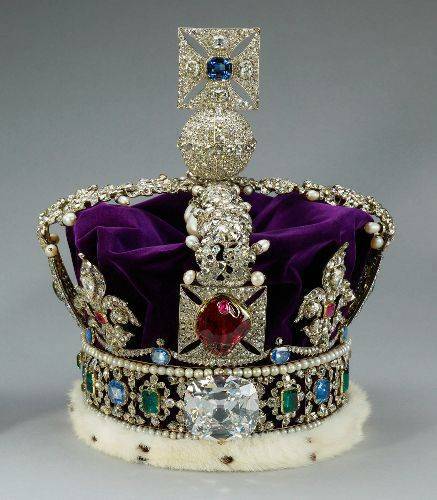 It is a crown made for George V during his visit to Delhi as the emperor of India. 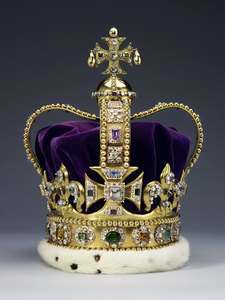 As the jewels of the crown can not leave the United Kingdom it was necessary to make a new crown specially for the occasion. It contains 6000 diamonds. 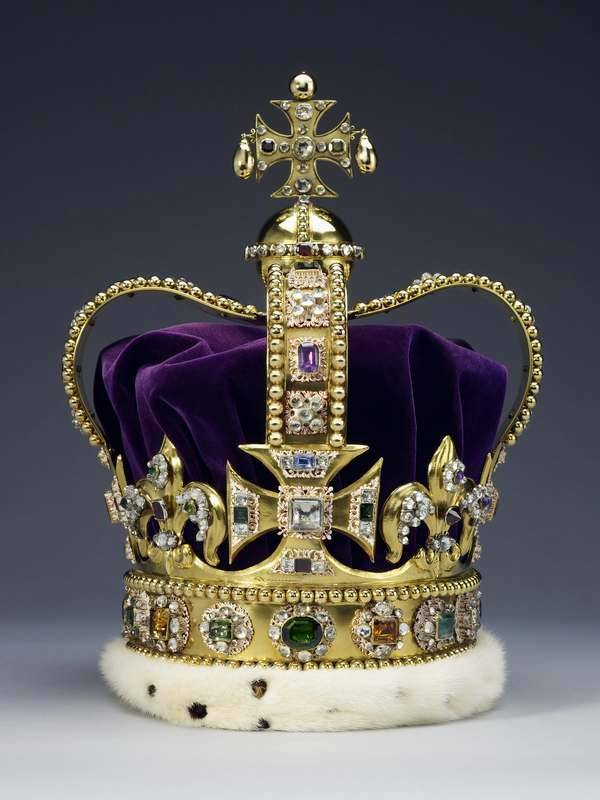 Learn more about: Imperial Crown of India. L'histoire retiendra le colonel Blood en tant que voyou audacieux, capable d'un exploit que seul un esprit malicieux peut réussir. Il a tenté de voler les joyaux de la Couronne. Né en 1618, Thomas Blood était irlandais, originaire du Comté de Meath et le fils d'un forgeron talentueux et prospère. Sa famille n'avait pas seulement une richesse mais aussi un prestige, Thomas venait d'une longue ligne d'hommes et de femmes respectés, son grand-père avait même servi en tant que député. La vie s'est agitée pour le bon vieux Thomas lorsque le Wark civile anglais a éclaté en 1642 et il été expédié en Angleterre pour se battre pour le roi Charles I. Monsieur Blood était clairement un homme d'esprit pratique, et dès qu'il était évident que Cromwell gagnerait cet guerre, il a changé de partie pour rejoindre les Roundheads. Ce mouvement audacieux lui a assuré la récompense d'un grand état lorsque Charles I a été vaincu mais, comme le sort lui est tombé dessus, Blood dut fuir le pays lorsque Charles II est parvenu sur le trône. Les historiens ne semblent pas être d'accord sur son sort mais la ville de Londres indique qu'il séjourna en Italie. Le colonel n'était certainement pas content de ce tournant de l'histoire et, avec d'autres Cromwelliens mécontents, tenta d'autres coups d'éclat comme celui de la prise du château de Dublin, pour capturer le gouverneur. Des années plus tard, étant déjà l'un des hommes les plus recherchés de toute l'Angleterre, il osa revenir sous une fausse identité et a même commencé à pratiquer la médecine. La vie d'aventure de Blood (un sujet populaire pour quiconque a pris l'un des cours de français que Londres a à offrir) était loin d'être terminée, et c'est alors qu'il commença à travailler sur un complot pour voler les joyaux de la Couronne. Ceux-ci étaient gardés en toute sécurité à la Tour de Londres dans l'un des sous-sols inférieurs, constamment surveillés par leur gardien Talbot Edwards. Thomas passa un peu de temps à s'amuser avec Edwards, construisant une amitié qui lui permettrait éventuellement de voler les bijoux. C'était le jour voulu où il avait établi une rencontre entre son neveu et la fille d'Edwards que le vol eu lieu. Parfaitement huilé, le vol commença par éliminer Edwards et parvint à mettre la mais sur les bijoux. Malheureusement pour lui le destin lui joua un tour juste à ce moment, un témoin ne devant pas être là le reconnu et lança l'alerte. Les plans du colonel Blood furent déjoués. Aussi incroyable que ça puisse paraitre, la chance a joué en sa faveur. Son charme et son esprit ont réussi à gagner la volonté du roi, qui a non seulement épargné sa vie, mais lui a redonné sa liberté et des terres lui rapportant une belle somme, annuellement. Après cette affaire il est devenu un visage familier à la cour et un homme plutôt populaire. Cette histoire impressionnante et presque incroyable fait de Thomas Blood l'un des personnages les plus intéressants (et les plus chanceux) de l'histoire de l'Angleterre. Les Joyaux de la Couronne n'ont jamais été volés depuis, aucun autre n'a eu l'esprit ni l'audace du colonel pour tenter un tel projet ! Edward the Confessor deposits his royal ornaments in Westminster Abbey to keep them safe. 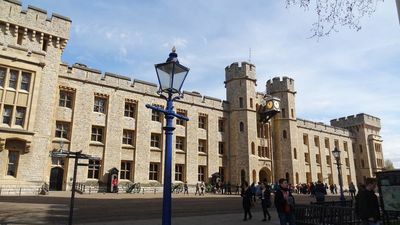 Movement of the jewels from the crown of Westminster Abbey to the Tower of London, which then served as royal treasury. Edward III waged the jewels of the crown to pay his troops during the 100-year war. This practice was subsequently prohibited. The jewels of the crown were melted by Olivier Cromwell supported by the parliament. This period emphasized the rejection of kings. Some precious stones were sold, but fortunately most of the jewels remained set on the jewels and could be recovered as they were. The replacement of the lost jewels is estimated at 13,000 pounds sterling, they were ordered and manufactured. The first visitors to the Tower of London were able to contemplate the jewels. Colonel Thomas Blood and his henchmen tried to steal the jewels at the Martin tower, but without success. The jewels are moved to a secret place after the start of the Second World War, to ensure their safety. The collection returned to the tower after the war. The Waterloo block now house jewels. The house of jewels passes in the basement in order to better accommodate the public which goes up to 15000 people per day.